Drop me off back in 1983. I understood the holidays better back then. Maybe we all did, I don’t know. I was just a kid, but I can still feel it in my bones, and that’s no lie. If I stop whatever current crap I’m doing and take a couple deep breaths and focus, turn slowly around and walk backwards in ways I can’t possibly walk forwards, then I can get there if I really want to. The Ghost of Christmas Past. What a beautiful thing. When a Culture Club cassette under the tree was a thing. And a damn good thing, too. Or Huey Lewis and the News. Or … oh my god … Duran Duran, “The Union of the Snake,” a cassingle in your stocking. My little brother Dave and me, we didn’t get much that was electronic or complicated. There were things like that, I guess, but for the most part my single mom couldn’t afford them. So every few years we’d each score something like a battery-powered handheld baseball game if we were lucky. And we were lucky. Our divorced single mom always made sure of that. One year in the early ’80s, I rushed down the dark cold 5 AM Christmas morning steps — damn near tripping over my beating heart — and burst into our living room to the sight of a giant plastic Millennium Falcon under the tree. That’s what the tag said. Strangely enough, all these years later, I can still vividly remember sitting there on our worn-out carpet in the dining room glow of the tree lights. In that moment — and I don’t know how such moments become so ingrained in our psyche, their very scent carved deep into our bones — but in that moment I remember taking a deep drag of the smoke from my mom’s slightly burnt Pillsbury Orange Rolls wafting in from the kitchen and clenching my Millennium Falcon so tightly in my fists and thinking — no, KNOWING — that I was the luckiest kid on the face of the Earth right then and there. I wasn’t, of course. Not by most people’s standards anyway. But I thought I was. So that’s all that mattered. Everything is fading, I know that. That’s the nature of the aging beast. But so much comes hurling back at me from behind at this time of year. 1983. Christmas catalogs. “Wish Books,” we called them. They’d mysteriously show up on our kitchen table sometime before Thanksgiving, and by the time Christmas day rolled in every single one of those ten million pages — from the Tough Skins and Underoos straight back to the Atari games and Tonka trucks — were all fingerprint grubby, with pen mark stars and circles everywhere. Life before the Internet seems so ancient, doesn’t it? We looked at catalogs. Catalogs. Made of paper. Remember that stuff? We were giddy for weeks because we could look at the same goofy pages of a catalog over and over and over again with hope in our hearts. We were the last of a breed, I suppose. Like dinosaurs before the comet. I kind of dig that. You remember how it was? No on-demand. No DVR. No DVD or even VCR. Dave and I would wait for weeks for the Christmas specials to air. My mom was spectacular at remembering when they were going to run, too. These days I own them all on DVD — they’re a dime a dozen; my kids can watch Frosty or Rudolph in the middle of freaking July if they want. Back then you had one shot. A Charlie Brown Christmas? Sunday night, 7 PM. You miss it, come back next year. The Night Before Christmas? Friday night, 8 PM. Then right after that: The Town That Saved Santa or whatever at 8:30. We would prepare for weeks, my mom handing us our advent calendars as we gobbled our Captain Crunch each morning, reminding us that this Christmas show or that one was on tonight. Then we’d think about it all day long. We’d talk about it on the school bus. Other kids knew: tonight was the night. Shopping malls lit up and crowded. Me and my mom and my brother window-shopping a hundred yards away from The Hickory Farms stand and yet we could smell it so clearly. Smoked gouda from far away made us happy inside. The gushing of the big fountains outside the Woolworths. The Christmas music piped in from above. Santa’s village. The train circling through the deep cotton snow. An Orange Julius and a Chik-Fil-A sandwich if we were good. An Orange Julius and a Chick-Fil-A sandwich even if we weren’t. If we could only celebrate Christmas like it’s 1983 again, you know? 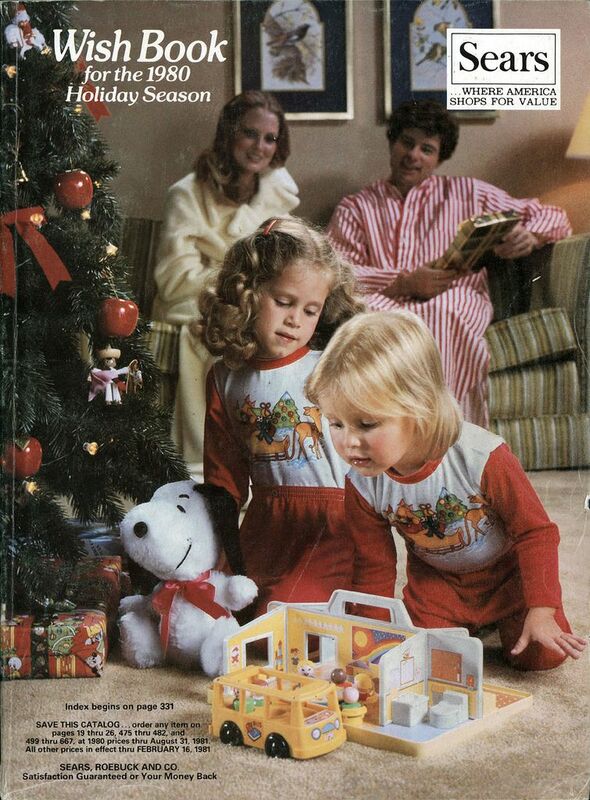 A few hours to reconnect with the true magic of Billy Idol and the Sears catalog and the cheese smell at the mall and our young mom and laying in bed at night still very, very certain that the North Pole was a place where important things went down. These past few weeks, the madness of too much to do, the stress of the money, the run run run: I take a little coffee break when no one else is home. I turn on the Sinatra Christmas album, sit down, close my eyes. Then it comes flooding back to me way more than I ever dreamed it would, or could. It doesn’t matter that I’m older and way further down the road. I close my eyes and smell Christmas of 1983. I take a super deep breath of it. I hold it in until the kids come home. Then I kiss ’em each on the head, just so I can gently breathe it all out through their hat-mess hair. Connection made. I slow down a little. I take it all in. I forget about the gifts and the BS. I see the tree like I’m 12 again. Or 9. Or 5. Even if it’s only for a few minutes, it’s still enough to remind me of what matters most. I miss you, ’83. But thanks for the memories.